The inaugural Leathwaite CFO Survey polled individuals in leadership roles within the CFO functions of financial services firms globally. 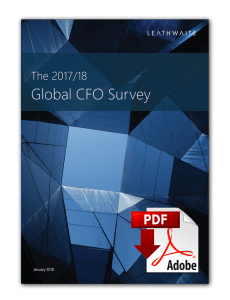 The survey was designed to give a global perspective on the areas of focus, challenge and investment for CFOs and their management teams. Regulation was highlighted as the biggest issue facing both organisations and finance leaders, but perhaps unsurprisingly the broader feedback suggests these leaders are trying to do more with less, and need better systems to get there.